The Turkish and Greek defense ministers have agreed to establish technical working groups to address issues including confidence-building measures, the Turkish Defense Ministry said on Wednesday. 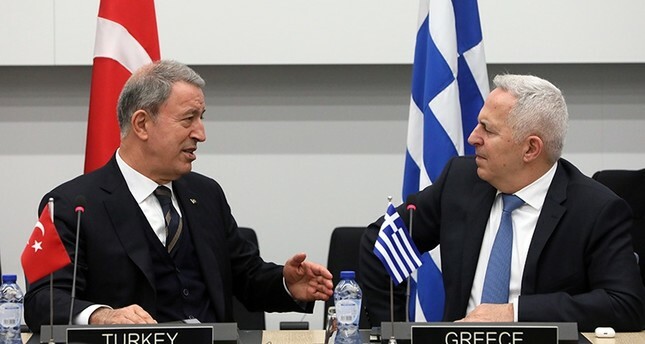 On the sidelines of a NATO meeting in Brussels, Turkey's Hulusi Akar and Greece's Evangelos Apostolakis met and discussed current issues between the two countries, the ministry said in a statement. Akar said after the meeting that Ankara and Athens should work to find peaceful solutions to their problems. Their meeting comes on the heels of Greek Prime Minister Alexis Tsipras' official visit to Turkey last week. Later on Wednesday, Akar met with NATO Secretary-General Jens Stoltenberg and discussed issues related to the alliance. The minister also met acting U.S. Defense Secretary Patrick Shanahan in Brussels on Wednesday. Akar also met with his Georgian counterpart Levan Izoria and Montenegrin counterpart Predrag Boskovic.